﻿ Honorary Consultative Meeting | Embassy of the Republic of Namibia in Washington, D.C.
H.E. Ambassador Monica N. Nashandi posing for a picture, with Namibia’s Honorary Consuls to Canada, The Bahamas and the United States of America, on 25 January 2018. 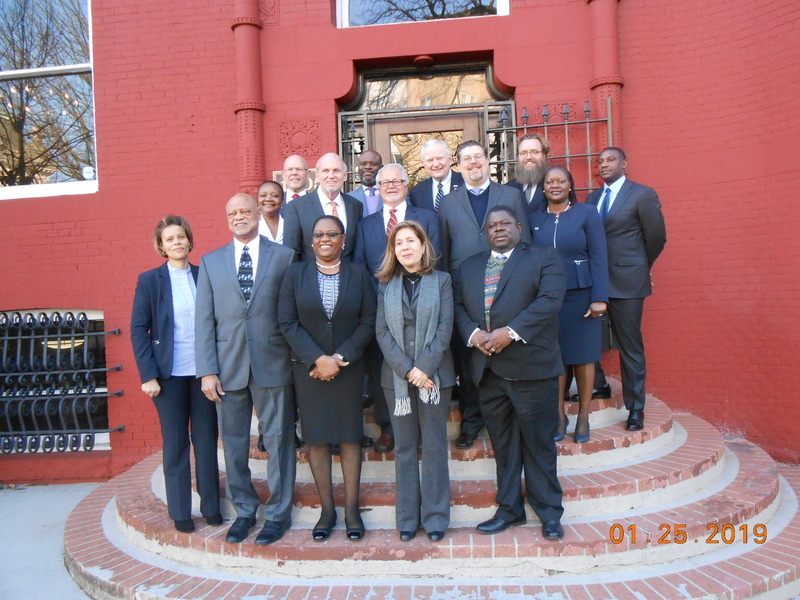 Ambassador Nashandi convened a Consultative Meeting with the Honorary Consuls at the Chancery in Washington, D.C. The meeting was well attended. The discussions concentrated on exploring ways to further strengthen bilateral cooperation between Namibia and the Honorary Consuls’ areas of jurisdiction. The meeting resolved to focus on, inter alia, marketing Namibia as the best tourist destination, education opportunities for Namibians, cooperation in the health sector, promote trade and attract potential investors to Namibia, and last but certainly not least, encourage people-to-people contacts through initiatives like twining agreements and cultural exchanges. As part of the Mission’s drive to promote Namibia, Ambassador Nashandi and Mr. Stephen Snively, Namibia’s Honorary Consul for Orlando, Florida, will co-host a National Day event in March 2019 in Washington, D.C. Ambassador Nashandi will make a presentation at the event about Namibia. Furthermore, sometime in May 2019, the Ambassador will speak at a promotional event to be co-organized with Mr. Robert Braubach, Namibia’s Honorary Consul for San Antonio, Texas. The event will take place in San Antonio, Texas.